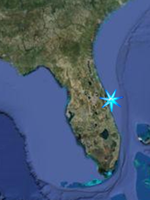 This Symbol indicates that the site is a designated site of the Great Florida Birding Trail. From I-95 take SR 528 26 miles to Florida 417 south, then stay on 417 for about 2 miles to Moss Park Road (Exit 23). Turn Left on Moss Park Road. Go one mile and take the second right to stay on Moss Park Road. Go 0.7 miles and turn right to stay on Moss Park Road. The entrance will be about two miles ahead on the left. Located between two lakes, this large 1500 acre park offers many recreational opportunities and bird watching locations. Over 100 species of birds have been sighted there including sandhill crane, wild turkey, wood stork, and migratory songbirds along with deer and many other species. Split Oak Forest at 1800 acres has over 8 miles of hiking trails. The trails are divided into 3 loops: the 1 mile Lake Loop (blazed blue), the 3.2 mile North Loop (blazed green) and the 4.5 mile South Loop (blazed yellow). Also, there are two small spur trails: the Lake Hart Spur and the Bonnet Pond Spur. Each are accessible from the Lake Loop. From SR 520, go 4 miles south on US Hwy 1, turn right on Gus Hipp Blvd and go 0.4 miles. The park entrance is on the right. From US-1, turn west onto Barnes Blvd and travel 0.5 miles. The Sanctuary entrance is on the north side of the road. Bike rack provided. Visitors to the Cruickshank Sanctuary can hike the 1 mile trail on the western portion of the 140-acre sanctuary. This trail winds through pine flatwoods habitat where raptors may be circling overhead or perched in high pine trees. Patches of oak, sand pine scrub, and freshwater depression marshes add to the Sanctuary's diversity. Wildlife on site includes migratory birds, Florida Scrub-jay, bobwhite quail, raptors, gopher tortoise, Eastern indigo snake, bobcat, and more. The Rich Grissom Memorial Wetlands are located approximately two miles west of the traffic circle at the intersection of Wickham Road and Lake Andrew Drive. Visitors traveling on I-95 should take Exit 191 heading west approximately 2.5 miles. The wetlands are an integral component of Brevard County's water reuse system and are a popular site for birders, photographers, and eco-tourists. The wetlands consist of 200 acres divided into four cells of approximately 35 acres each, plus a central lake. The cells were designed to maintain differing depths of water, reflecting diverse wetland conditions. The entire wetland system is accessable by automobile, making the site popular among those who find the rigors of hiking trails and summer temperatures daunting. Even better, viewing the site from one's automobile serves to screen visitors from birds and widlife, enhancing the experience. Approximately 60,000 visitors per year pass through the main entrance to the wetland system, drawn by the site's breathtaking views and stunning abundance of wildlife. This shaded 25.96-acre community river park is along the shore of Lake Washington which accesses the St. Johns River. Sightings here include waders, eagle, purple gallinule, marsh and sedge wrens, limpkin, snail kite, sparrow; bobolink (during migration), and others. River lakes Conservation Area is part of the Upper St. John's River Marsh Wildlife Management Area, and encompasses 36,156 acres of the St johns River Watershed from State Road 520 west of Cocoa to State Road 192 west of Melbourne, and includes lakes Poinsett, Winder and Washington. The primary access is by boat from James G. Bourbeau Memorial Park, Leroy Wright Recreation Area, and Lake Washington Parks listed above. However, from the trailhead of the Mocassin Island Trail, at the Western end of Wickham Road in Melbourne, birders have a choice of hiking to the North or to the South. The north section is about 2.5 miles and ultimately ends at an observation point near Lake Winder. The South section will take you 2.6 miles south and west to the Oak Hammock Loop, which is itself about 2 miles, near the St John's River. Among the wildlife species seen here are wood storks, bald eagles, and many other species associated with the vast wetlands. Portions of this trail system may be seasonally flooded. Wickam Park is a popular 391 acre park with semi-improved camping, about four miles of narrow trails that meander through oak hammocks, scrub, pine flatwoods, and along marshy streams for both equestrian and hiking use, a paved walking trail, two unguarded swimming ponds, and several more small ponds, equestrian facilities, and a dog park. Some of the species sighted here include Brownheaded Nuthatch, Bobwhite, Painted Bunting, Chuck-will’s-widow, Raptor, Killdeer, Migratory Songbirds. FROM US-192 by the Melbourne Square Mall, go north on Evans Road 0.9 miles. The entrance is on the left just before Nasa Blvd. Erna Nixon Park is a 53.93-acre natural Florida hammock and nature preserve located just south of Nasa Boulevard southwest of the Melbourne Airport. Although surrounded by a commercial district, it is home to many birds and small animals, including the protected gopher tortoise and Indigo snake. A popular site for nature walks and outdoor festivals including the annual Crackerfest, it features an elevated boardwalk winding through three different ecosystems where native plant species and small animals can be viewed. 14 Miles of natural trails, only 6 miles are marked. Trails pass by Lake Lizzie and Trout Lake. Trailheads are located off of Bass Road for the North Loop and off of Old Melbourne Highway for the WP Tyson Trail Head that leads to the Marsh Loop and the Lake Lizzie Loop. FROM SR-520 go south 2.4 miles on S Courtenay Parkway. The park entrance is on the right. FROM the Pineda Causeway (SR-404), go north on South Tropical Trail/Courtenay Parkway 8.9 miles. The park is on the left. This 37.77-acre community park includes an interpretive nature boardwalk and a 1,500 sq. ft.Nature Center that resembles a Florida Cracker style schoolhouse and offers exhibits, tours and classes that focus on the Florida woods habitat. The Nature Center is the result of the volunteer efforts of the Merritt Island Rotary Club.To schedule a tour or arrange a visit to the Nature Center, call 321-455-1385. ADA ACCESSIBLE: Parking, Nature Center, Nature Boardwalk.